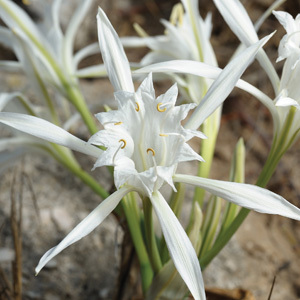 The Sea Daffodil (Pancratium maritimum) shows off fragrant pure white flowers once the blue-green strappy foliage has begun to die off. A native to the sandy coasts of the Mediterranean Sea, the fragrance is particularly strong in the evenings making this a wonderful plant to enjoy on balmy evenings. With foliage appearing after flowering in Autumn and growing on through the Winter months, the Sea Daffodil tends to be evergreen in moist soils making it particularly suited to pots as the attractive foliage will be a year-round feature. Being a coastal plant, Sea Daffodils will thrive in sandy soils and are very tolerant to sea breezes, but these plants can be successfully grown in most soils and climates. Prefers a full sun position for best results. Availability: OUT OF STOCK/OUT OF SEASON! Enter your email address below and we'll email you when it is back in stock. Availability: OUT OF STOCK/OUT OF SEASON! Available to order from mid-January to May, unless sold out. At Garden Express you can make a purchase with confidence. Our living merchandise is normally guaranteed to grow if our free growing guide instructions are followed. Any guaranteed items that do not grow within 3 months (6 months for dormant items) will be replaced, credited to your account or fully refunded. The exception to this guarantee is discounted, end of season stock which is sold on an ‘as is’ basis. Generally this stock is sound but should be planted as soon as possible and may not perform as well as normal in season products. Orders NOT containing Roses, 120mm and larger pots/grow-bags, Bare-rooted Trees, Composting Buckets, nor any items with individually specified delivery charges, all delivered at one time, will incur the normal $9.90 freight charge. These items are referred to as “Basic Items”. Orders containing bush Roses, 120mm up to 155mm pot/grow-bags, Composting Buckets, together with other products delivered at the same time will incur a $14.90 freight charge. Orders containing Trixie Fruit Trees, Dwarf Fruit Trees, Lilac Trees, Standard and/or Patio Roses, 160mm up to a 200mm pot/grow-bags, together with other products delivered at the same time will incur a $22.00 freight charge. Orders containing Bare-rooted Trees, Weeping Roses, Magnolias and other Larger items or pots/grow-bags greater than 200mm, together with other products delivered at the same time, will incur a $35.00 freight charge. Remote areas may incur an additional Freight charge but we will notify customers individually if this is the case. Orders containing products with explicitly stated delivery charges will incur charges as detailed in the individual product description. Some items may delayed due to climatic or growing habits prevent them from being harvested at the time of being offered for purchase. You will be offered a choice to wait until all items on your order are available or to receive what is currently available for an additional freight charge of $4.00. Orders containing products from two different seasons (eg Rose or spring bulb pre-orders) that require separate deliveries will incur two delivery charges at the relevant rates (unless a free freight offer applies). A $4.00 Quarantine Inspection Surcharge applies in addition to the Delivery Charge for orders delivered to Tasmania, Northern Territory and Western Australia due to the increased complexity of quarantine requirements. As quarantine inspections apply to each delivery, 2 quarantine charges will apply where orders contain products from different seasons. *Please note that if you order large items (eg Patio, Standard or Weeping Roses, Fruit Trees) you must specify a street address for the delivery address. StarTrack Express generally do not deliver to PO Boxes or RSD addresses so your order will be held until a suitable address is obtained. In rural areas StarTrack may deliver to physical addresses such as general stores that act as Australia Post agencies but we suggest you check with them first. Where ‘Free Delivery’ vouchers apply to an order, details of the voucher should be entered in the “Your message to us” field. Orders (except Pre-orders) are normally despatched within 7-14 working days from the time of ordering during busy periods. Delivery times may be extended during peak periods (typically following the release of the latest catalogue), extended public holidays, if extreme weather conditions are not suitable for live plant transport or as detailed in the product description. Individual items may be back ordered to avoid delaying the delivery of other items. Please allow additional delivery time for orders to Tasmania, Northern Territory and Western Australia due to quarantine restrictions. Please note: Some orders may not be possible to parts of Australia due to quarantine and some items may carry unique delivery charges. Check full delivery policy. Establish which coloured region you live in and then consider the varieties listed as typically suited to that area. The Australian Climate Guide map is intended as a guide only as climatic conditions vary between specific locations. Factors such as local altitude, wind and the proximity of hills, mountains and bodies of water can cause variations from the generalised climate map. 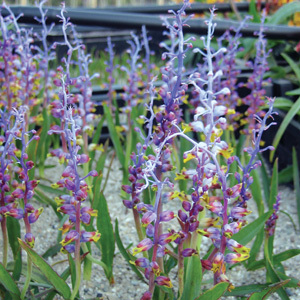 Note also that although a plant may be listed as suitable for a particular region, it may still require protection from extremes such as frost or strong winds. You should also consider its requirements for sun, shade and water. 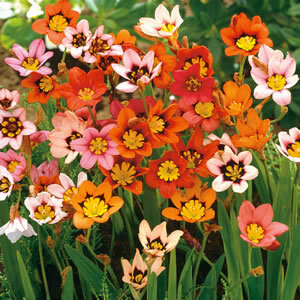 Remember that you can often extend the range of plants that you can grow by creating micro-climates within your garden. Planting under trees, beside brick walls or in the shelter of a building, on high or low points in the garden can all have an effect. Even planting by a pond or surrounded by rocks can be used to advantage. Part of the joy of gardening can be experimenting and nothing is more pleasing that achieving success with a plant that is not usually seen in your area. Tropical – hot humid summer .